It didn't take me long to decide I wanted to keep the Toulouse at my lesson on Thursday. 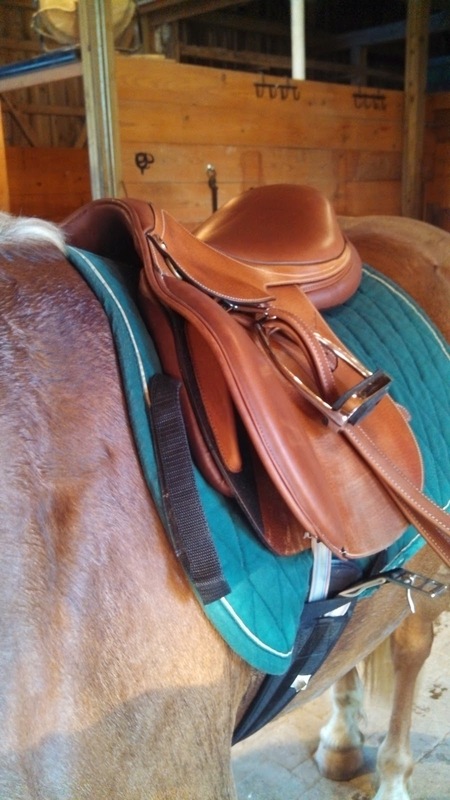 After my trainer gave it the green light as far as pony fit, I rode in it harder than I had on Tuesday, and found that not only did it keep my leg stable, it also made it easy for me to bring my hips underneath me - something I struggle hard with. I've never had a saddle do that for me before. I felt encouraged by the saddle to be in a really stable position, and fell in love. We discussed the fact that it's not pretty, and my trainer said, "True, but it fits you both well. Function over fashion." I love you, sport of eventing! I dub thee "The Unattractive Saddle"
Pretty is as pretty does, if it works it works and keep it! Looks better with a saddle pad between it and Connor :) I am all for function over looks, hence my tackroom full of Wintecs. I have one word. Oil. However I do recommend testing a spot on the underside first so if it doesn't make it better it isn't visible. Who cares, works for you! If it works, then that's the saddle for you!